Digital Momentum is the premier digital agency for the racing industry, focused on delivering marketing you can measure. For the last 15 years, our focus has been to help companies in the motorsports industry manage their digital presence and, ultimately, grow their business. This deep and focused experience, uniquely positions us to help your company grow. We speak your language, we can relate to your business, we recognize - and identify with - your customers. We Get Racing. The truth is, old school marketing just doesn't cut it any more. We consistently hear from companies that spend lots of money in offline advertising and marketing initiatives, but struggle to measure the return on that investment. Even more often, we hear from organizations who spend a lot of money on a website, yet are unable to articulate exactly how the site is adding value to their business. We want to help companies in the racing industry accelerate their sales and marketing efforts. The starting line may be different - you may be just beginning your digital marketing journey, or your internal marketing capabilities are already somewhat sophisticated - but the goal is still the same. Digital Momentum exists to help race teams, drivers, manufacturers, organizations and sponsors grow their business by pushing their digital marketing to the next level. Just like you, racing is in our blood, so winning is the only option. Digital Momentum provides winning digital marketing solutions for the best and brightest organizations and brands in the racing industry. We do this by combining user-centric website design and development principles, with the inbound marketing methodology, to deliver marketing you can measure. Digital Momentum was founded in 1998 as a traditional web design and development shop focused on building and managing websites for small businesses. In 2002, Chuck Tate (an avid kart racer) turned his avocation into his vocation, and adjusted the company’s focus to begin delivering website solutions specifically to clients in the racing industry. This combined passion and love of racing, technology and marketing, uniquely positions Digital Momentum to develop digital marketing strategies that help our clients win. Digital Momentum is a certified HubSpot Partner agency uniquely positioned to help you shape and implement a digital marketing strategy to help your business grow. 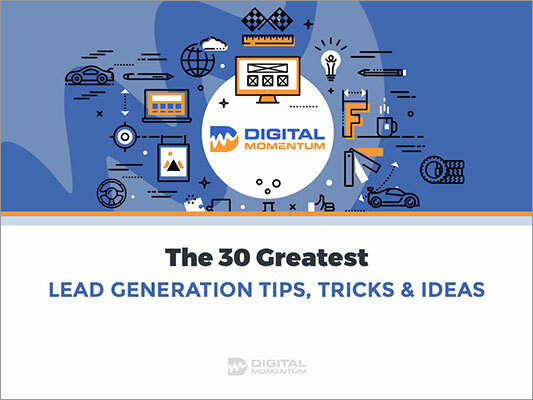 Check out these proven - yet often overlooked - lead generation strategies, in our free eBook "The 30 Greatest Lead Generation Tips, Tricks & Ideas".